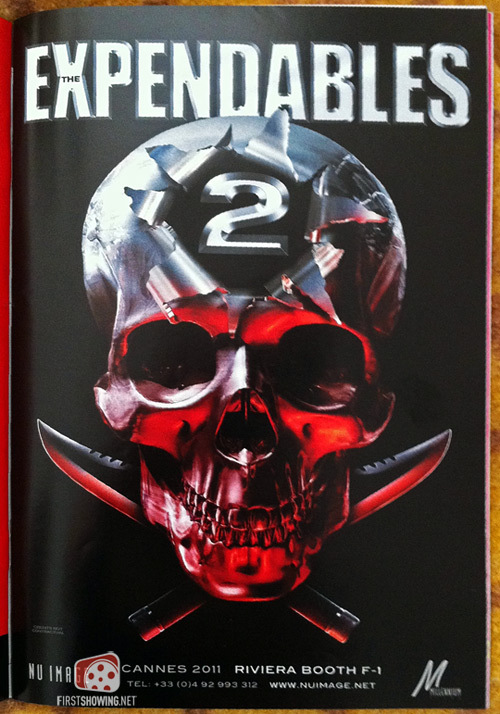 Cannes is beginning, and two years ago (almost to the day) we got our first look at some of the Expendables promotional images from giant banners hung in the city. Now history repeats itself as the prestigious festival is the source at the first imagery from the sequel to the most not prestigious of action films. Along with it comes a synopsis that makes it clear the Expendables are still in the damsel in distress business, but will this time have a very personal score to settle. Looks like Sly is ready to throw one of his precious cast-members under the bus for some nice revenge fodder, so tread lightly if you don’t want to know who. Seems like this is in-the-trailers kind of stuff though, so I wouldn’t clinch your sphincter too tightly. So Rourke’s character eats it eh? Makes sense- you can give him one nice chewy scene in the opening, he’ll probably have a grumbly, witty little monologue before he gets wacked, and everyone has a good reason to forcefully remove folks asses for the rest of the film. While there’s a script and a date (August 17th, 2012) and maybe a villain, there’s no director yet, so look for word on that soon.